ANTIQUE VICTORIAN ETRUSCAN 14kt GOLD CARVED CORAL CAMEO GRADUATED BEAD NECKLACE. This exquisite piece has a lavalier style pendant featuring a carved coral cameo in a fancy, raised prong setting accented with finely detailed leaves raised above a plain setting which has a milgrain zig zag accent all around. There are also three diamond shaped dangles with fancy, milgrain finished scrolls. The cameo hangs from swinging horseshoe shaped mechanism. The necklace itself is made of salmon colored (showing more yellow in photos than they actually are, sorry), graduated coral beads. It has a tongue and groove style clasp that is marked 14 for 14k which has also been tested along with all of the other gold metal parts of the necklace, all 14k. CONDITION - The necklace is in very fine, antique, pre-owned condition! Normal age/use wear, some of the coral beads are dulling from age, natural irregularities in the cameo (one is right at the tip of the nose and has filled with dirt) original found patina with cameo setting showing tarnish probably because it is harder to polish the the other parts - as with all of my estate items, I have not cleaned it. 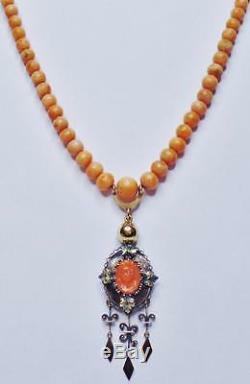 SIZE - Cameo along with hanging mechanism and dangles measures approximately 2 5/8" long, 3/4" wide, coral bead chain is 22 long, beads range in size from 8mm to 3mm. A stunning Victorian necklace to give as a gift, wear yourself or add to your collection! S TRADING PLACE FOR OTHER ITEMS! Flat rate will be clearly stated. Calculated rate will apply for heavier items. If there is a need to return an item. I try to respond to all correspondence within 48 hours. In order to insure an accurate and timely response, please include the Listing ID Number with all correspondence, thank you. Show off your items with Auctiva's Listing Templates. The item "ANTIQUE VICTORIAN ETRUSCAN 14kt GOLD CARVED CORAL CAMEO GRADUATED BEAD NECKLACE" is in sale since Monday, November 23, 2015. This item is in the category "Jewelry & Watches\Vintage & Antique Jewelry\Fine\Victorian, Edwardian 1837-1910\Necklaces & Pendants".